They had us at the view. Our room at the 12 Apostles Hotel wasn’t quite ready at check-in, so we were invited to drink chilled South African bubbly in the Leopard Bar (on the house, of course). The Leopard Bar must be one of the best bars in the world. Inside, the cozy space is decorated with leopard print carpeting and gilt-framed pictures of leopards. We sat out on the terrace. Sea salt scented the air. Gulls perched on the white colonial-style balustrade. 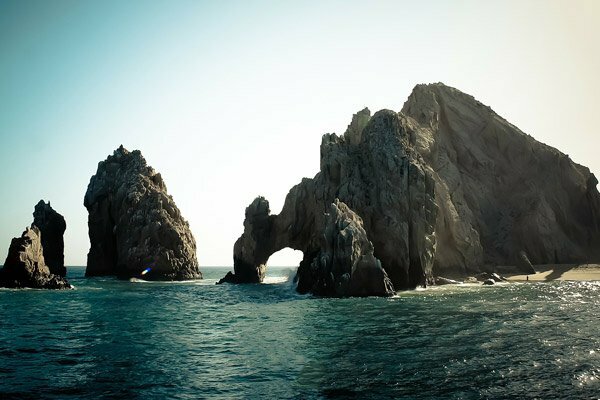 And we gazed at enormous waves crashing on the giant boulders lining this stretch of Atlantic coast, as an orange sun dipped below the horizon. Oysters, bubbly and this view, followed by a smashing sunset; we were content! Two glasses of bubbly each later (and long after our room was ready), we reluctantly decided to see our room. That welcome set the stage for our stay at the stunning Twelve Apostles Hotel and Spa in Cape Town. 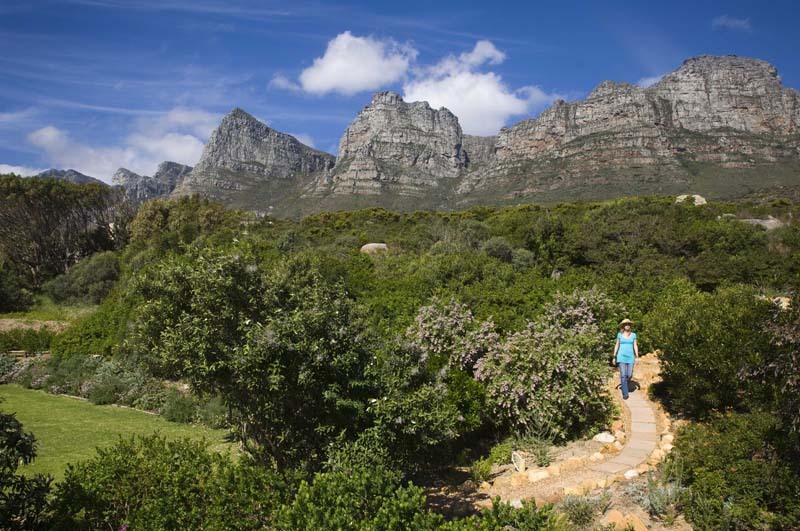 Flanked by South Africa’s iconic Table Mountain and the Twelve Apostles mountain range, the hotels is on the scenic route just outside of “central” Cape Town. 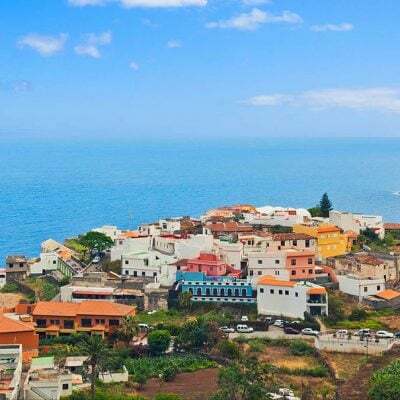 Built around a Dutch-style hunting lodge dating back to 1929, it’s made up of three low-rise, white-washed buildings, connected by skylit walkways. The 12 Apostles Hotel & Spa has a 16-seat private cinema, screening some six movies a day (several are oldies like “Casablanca”). The hotel has 70 serene rooms and suites. 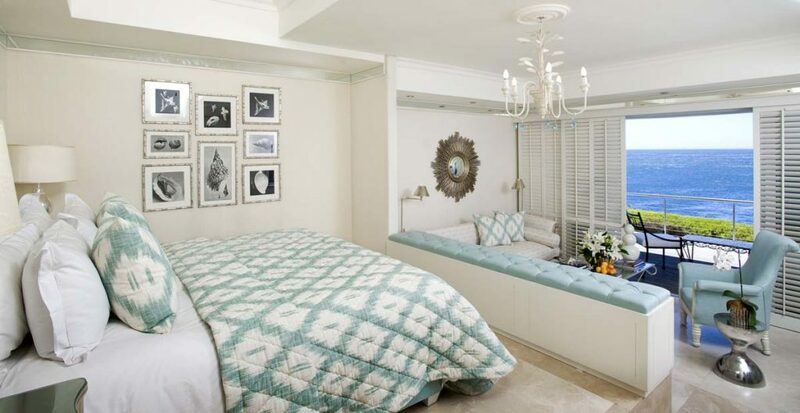 Each room is individually decorated. 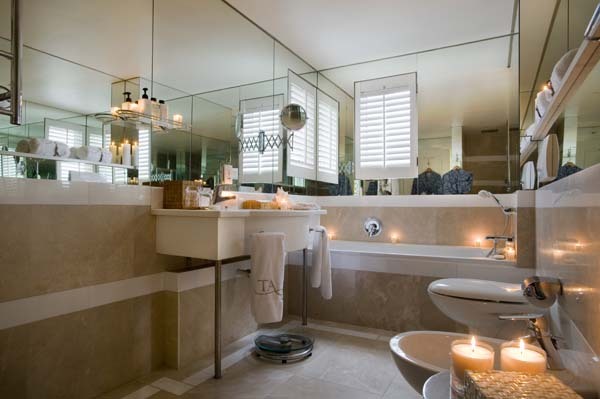 But you can expect creamy marble floors, white louvered window shutters, four-poster king beds with luxurious linens embossed with the hotel’s logo, an in-room Nespresso machine and both winter fleece-lined silk bathrobes and summer cotton robes. You can tell the interior designer had fun here. Hallways are laid with carpets striped in multiple colors of red, blue, yellow and green. The numbers for the guest room doors are placed inside what looks like a a shell. And the original art on the walls ranges from the somewhat serious (gilt-framed oil paintings) to the whimsical (collections of tropical fish). It all lends the hotel a light-hearted beachy feel. Behind the hotel, several private trails wind up the mountain, past cacti and pine trees. You can take a picnic basket to enjoy at one of the hotel’s scenic picnic spots, which have stone benches and sun umbrellas. Fancy a picnic at a spot like this on the mountain behind the hotel? 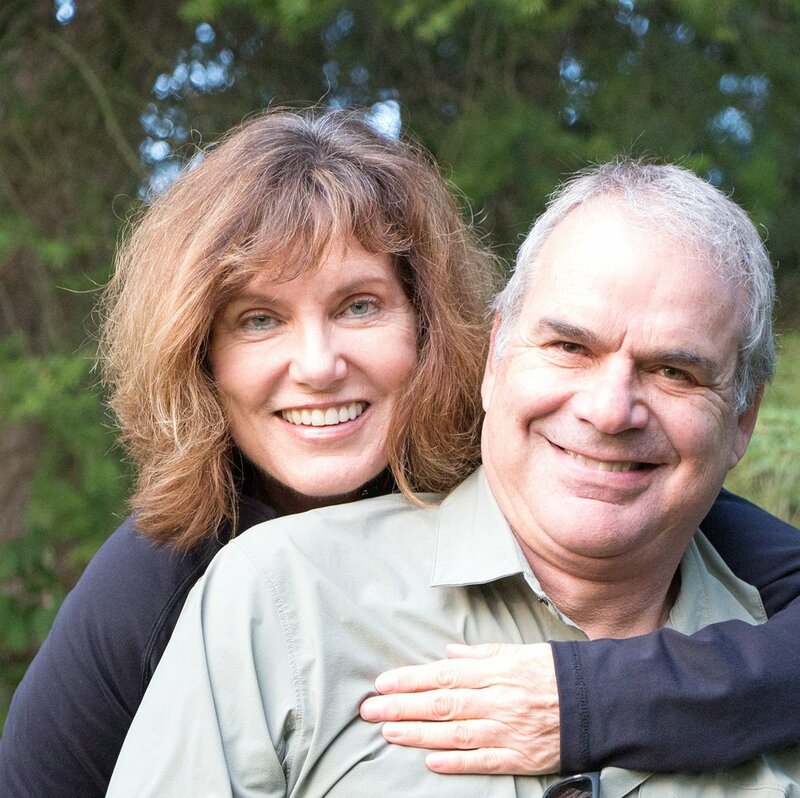 Planning a safari? You won’t believe the wildlife galore on a Chobe safari in Botswana! 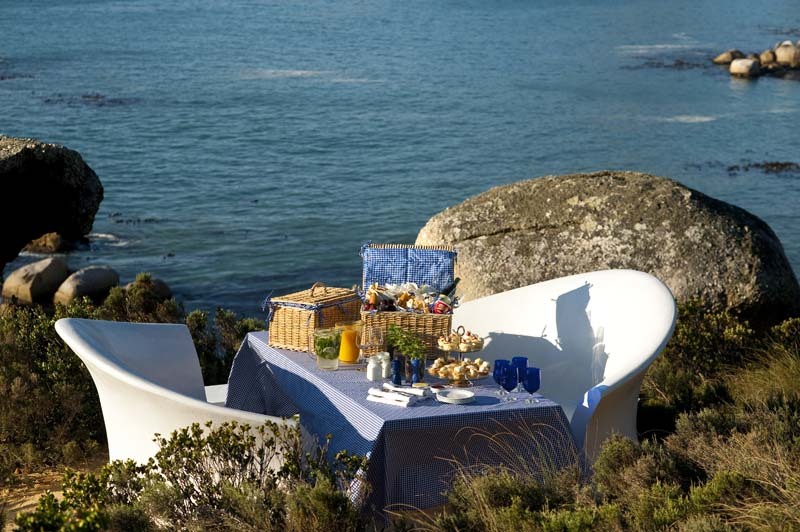 Be sure to treat yourself to dinner at the Azure restaurant in the 12 Apostles Hotel. Everything is tantalizing, starting with the lovely selection of house-made breads (cheese sticks, heavy whole grain and date-and-seed bread), accompanied by both regular butter and an anchovy-and-whipped-cream-cheese paste. And the prawn curry! It’s very light, almost like a soup, with at least a dozen little plates of coconut almonds, roasted almond slices, lime chutney and other bits and bites to spice up things. The palate cleanser of two little spoons of berry sorbet before the main course is a show-stopper– the waiter pours liquid nitrogen into a ceramic tea pot on the table and the fog overflows all over the table and rolls down onto the floor. The breakfast buffet in the restaurant – complete with bubbly and oysters – is also an affair to linger over. Pssst! Check out the fun wine tasting tour we did in Stellenbosch! The Atlantic Terrace pool is another great place to park yourself for a while. It too has great ocean views. It’s the extraordinary service, however, that really makes this boutique hotel a standout. 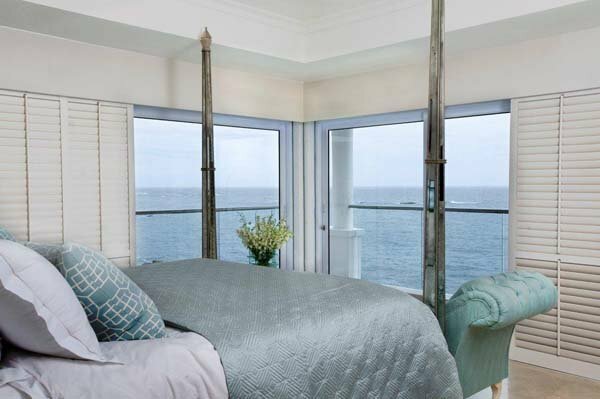 From sanitized TV remotes (sealed in plastic after each guest use) to smiling staff galore, the Twelve Apostles Hotel & Spa knows how to win over its guests. Many people like to stay around the central Victoria & Albert Waterfront area in Cape Town. We found that area quite touristy. 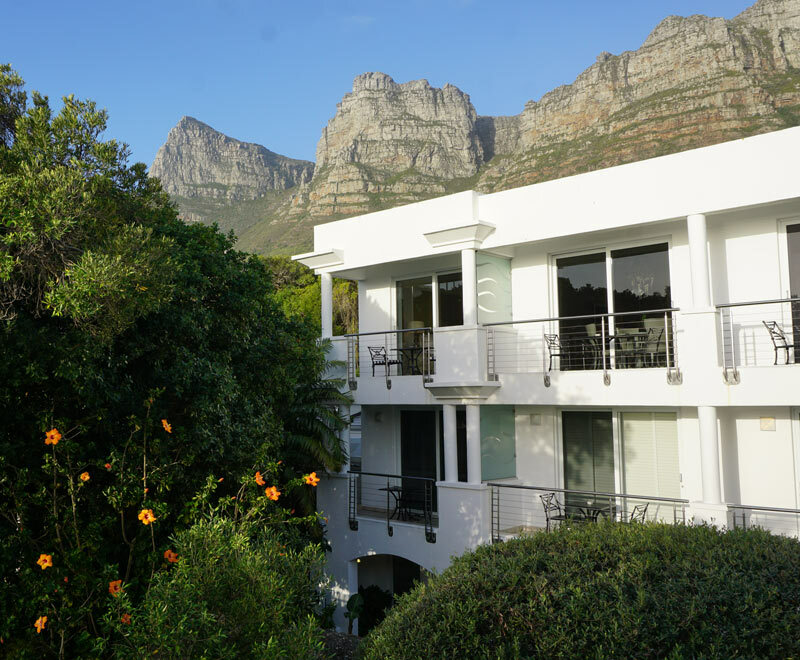 Located in Camps Bay, on the edge of Cape Town, the 12 Apostles Hotel is admittedly not smack-dab in the center of things. 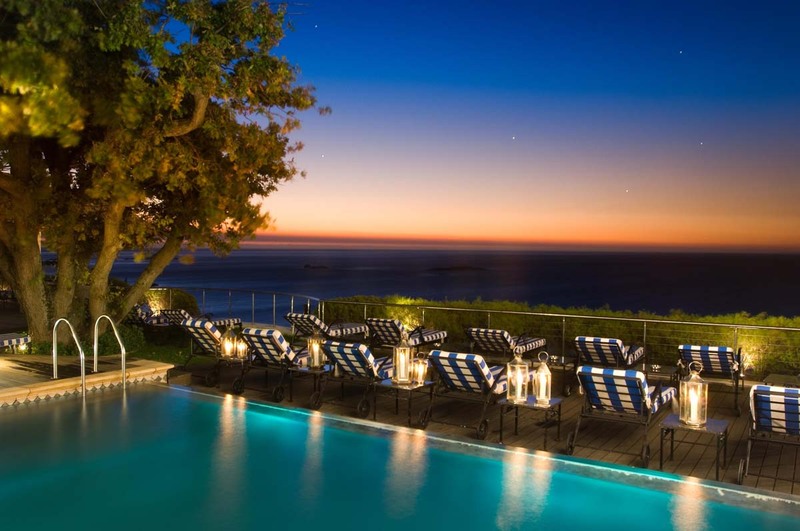 But it offers complimentary hourly transfers by luxury SUV to the city’s central V&A Waterfront – as well as the beaches and restaurants of Camps Bay. So you can easily get into town to tour Cape Town’s sights. For us, the location was perfect. 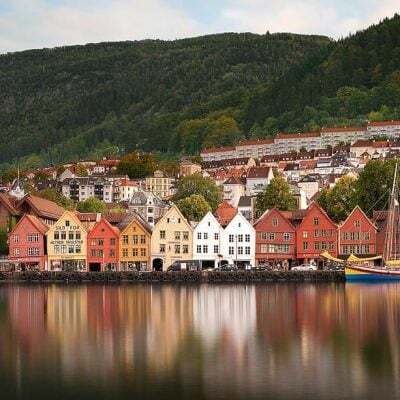 We had the feeling of a seaside resort, but with easy access to everything we could want to do in the city. The 12 Apostles consistently rakes in top awards, including most recently, third place in the “Top 20 Hotels in Africa” (Conde Nast Traveler, 2018) and “One of the Top 25 Hotels in South Africa” (TripAdvisor, 2018). Without a doubt, it’s one of the top 5 star hotels in Cape Town, and we’d have no hesitation staying there again! Like this hotel review? 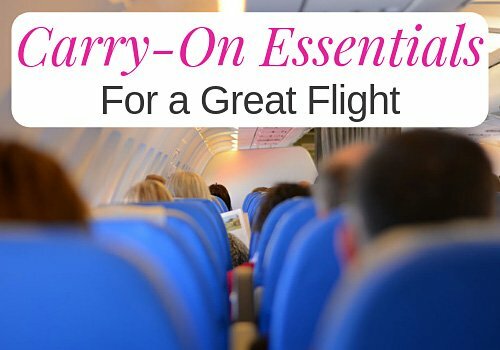 Then pin it to your Pinterest board! 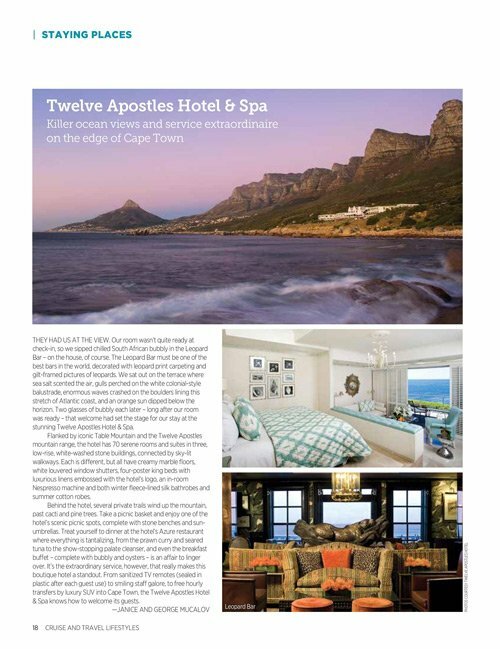 See our story on the Twelve Apostles Hotel & Spa published in Cruise & Travel Lifestyles magazine. 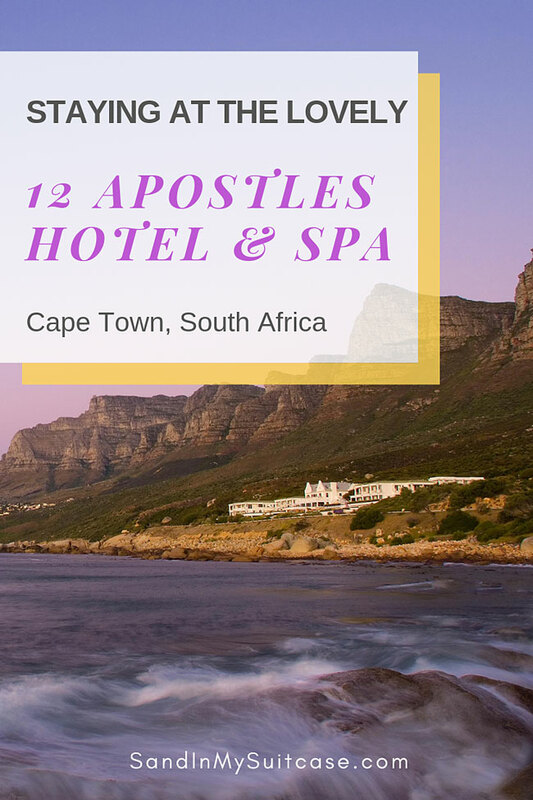 We stayed as media guests for the purposes of writing a 12 Apostles Hotel review. 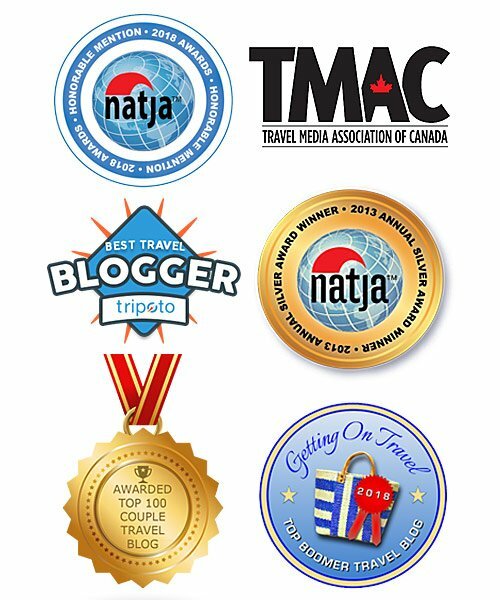 But we are always free to write what we want (the good and the not-so-good) for the magazine and newspaper articles we write, as well as for posts and reviews on this blog.